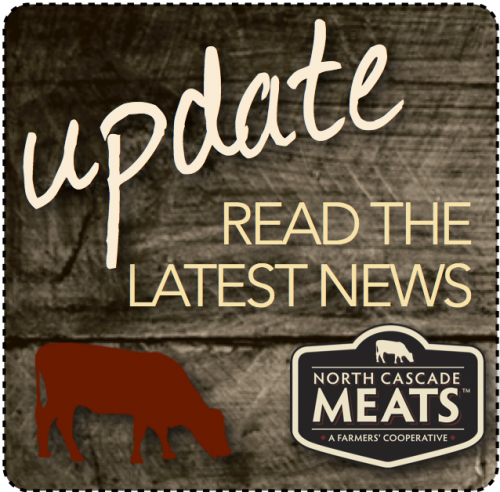 As of June 30, 2013 the North Cascade Meat Producers Cooperative stands with 30 members and $51,500 in capital raised, as well as securing a $65,000 “matching funds” loan commitment from the Whatcom Community Foundation. The cooperative’s current business plan requires a total of $105,000 in capital from memberships, as well as another $290,000 in financing in order to open for business. The Board of Directors has determined that there will not be a sufficient level of producer engagement to enact the current plan. Therefore we would like to consider moving forward with a scaled-down business model that will still provide expanded regional processing capacity and market opportunities, while providing value and a good return to members. The Board of Directors met last night to discuss two new potential options for the Co-op to research and consider. We must frame these options in very general terms because they are each in a very initial stage and must be held in confidence to ensure the parties involved will continue to be willing to work with us. What we can say is that both of the options under consideration will involve the Co-op contracting with someone else to provide cut and wrap services. NCMPC still intends to contract use of the USDA-inspected mobile unit from the South Puget Sound; would still implement the North Cascade Meats branded marketing and distribution program; and work to negotiate “bulk buy” processing prices for its members who seek USDA-inspected services for their own farm-sales and members who seek WSDA custom exempt services. This means the NCMPC business model would serve its members as a purchasing and marketing cooperative, but not as a processing cooperative other than for USDA slaughter, thus not having to capitalize the associated costs of a processing facility. Board members Sandy Matheson, Myrle Foster, Nancy Hibbing and Pat Grover are charged with working together to prepare for a meeting with parties from one of the potential options by August 2nd. Jeff Voltz from NABC is working with parties from the other potential option and expects to have something for the Board to review within the next two weeks. The Board is now meeting weekly on Monday evenings to conduct due diligence and move this process along. All individual member investment funds still currently reside in an escrow account at the Industrial Credit Union in Bellingham. The only financial need, a monthly payment of $317.65 for Directors and Officers liability insurance is taken care of through September 15, 2013. It is the Board’s intention to leave all member investment funds untouched until these new options are vetted, at which time the Board may ask each Co-op member to sign a revision of the current Member Offering and Disclosure document, or a new one. Individual members will be able to choose to stay in or opt out at that time. If members opt out or if none of the options appear to be viable by September 30, 2013, all member investment will be refunded in full. We will continue to provide updates of this nature during this process.